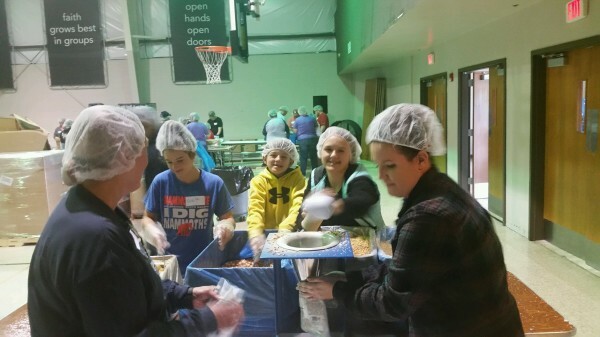 Broken Arrow Club members (l-r) Noelle, Steele, Jade, and Coach Nicole Cullison helping out with filling packaged meals for the Feed My Starving Children organization. 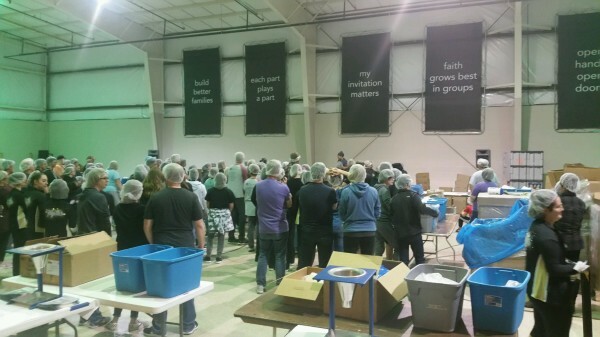 Dozens of volunteers helped pack 150,000 dry food pouches that contain enough for 6 cooked meals. Coach Brad Balmer and wife Shelley helped seal, organize and pack the boxes for transport. Club members Coach John and Susan Strelow brought this all together on station table #4. We thank them for inviting us to lend a hand. We packed 24 boxes with each holding 36 pouches. This was all acomplished in 3 two hour sessions. 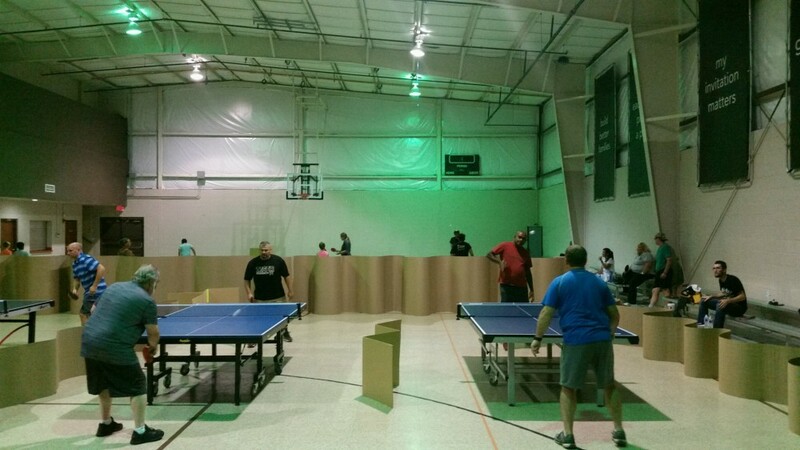 What a great effort put forth by all the volunteers and Northside Christian Church. League Night returns to this Friday, 11/09. 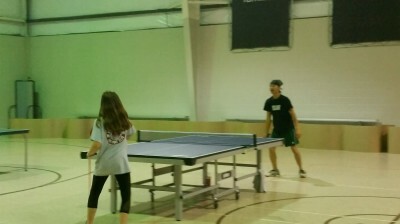 League Night 9/7, had the most participants yet with 26 enthusiastic ping pong warriors, battling it out for top table honors. 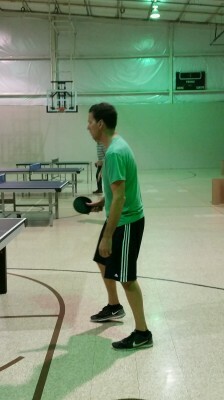 Coach Okba, once again won table one with a perfect 4-0 record. Matt Mysse had a stellar showing, in winning table two, over 4 other game opponents. Table 3 saw Ross McCarty take home 1st place, with Irina Silantyeva edging out rising club junior Noelle Cullison on table 4 action. Newcomer and club junior, Dharan Moorthy was crowned champion of table 5. Great effort by all and hope to see you next week. Bring a friend!!! 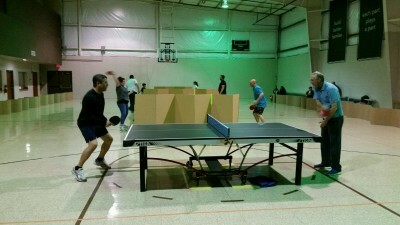 League Night #11 had twelve participants vying for top honors in 2, six-man round robin groups. Table one had Edgar Acosta dust off all competitors on the way to a stellar 5-0 match record. Edgar continues to improve week to week and recently ventured to the Tulsa Club, to match skills, with some of the top local players. 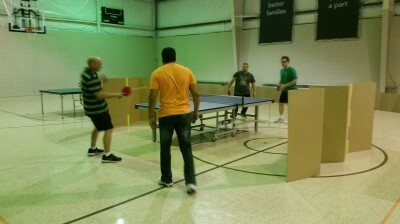 Brad Balmer finished in 2nd with a respectable 4-1 record, with Vic Gopi moving into 3rd at 3-2. Table two had Jakob Keener defeat all five players on his way to a perfect 5-0 record. Great job Jakob! The deciding match was with Kurt Turner who finished with a 4-1 match record that secured 2nd place. Newcomer David Cullison looped his way to a 3-2 record and a 3rd place finish. League night continues every Thursday with a start time of 6pm. We have extra paddles available if needed. 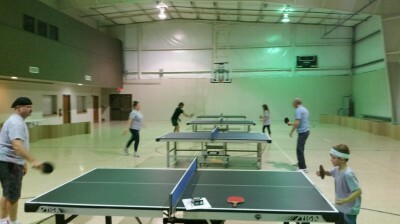 Table Tennis is such a great sport for family participation. It is healthy, and inexpensive to play. 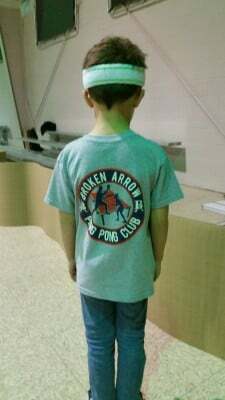 Spread the word about the Broken Arrow Ping Pong Club. Hope to see you next Thursday and Bring a friend!!! 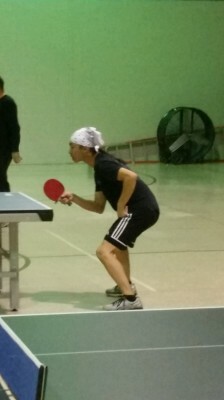 League night #9, had a sharp increase in participation with 14 players vying for top honors. Table 1 had Alex Tupas win with a hard fought 5/0 match record. Brad gave Alex a battle with a hard fought 3/2 loss. Alex is closing in on moving into the number 1 ranking position currently held by Okba Harfouch. Edgar then proceeded to also defeat Brad to take 2nd place with a 4/1 match record. Edgar is improving fast (470 point rating increase) and I anticipate he will win table 1 soon. Great job Edgar! Table 2 had two newcomers in attendance, with Jakob Keener taking 3rd place, right behind 2nd place finisher Greg Tater. Jason Mann battled through the competition to secure 1st place with a perfect 4/0 match record. Welcome to the club Jason and Jakob, and great job! Regulars Kurt Turner and Michael Muse took 4th and 5th place respectively. Both continue to improve and I expect their ratings to also increase. Table 3 had Zach Hoover win 1st place, with his nephew Joziah taking 2nd. Great first table win for Zach, and I expect Joziah will continue to move up the rankings list due to his dedication and enthusiasm. This was a good ending to January play with February expectations even higher. Good luck to all and hope to see you this Thursday 02/01 at Northside! Spread the word and Bring a friend! League night #8, had an increase in participation. Eight road warriors looped and chopped their way through 28 total matches played. Edgar Acosta did his best, 6/1, to knock off Brad, 7/0, from winning the table for a 2nd week. 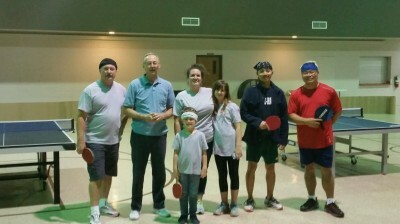 Edgar is coming off winning a Broken Arrow Recreation Department TT tournament, which was held at the Nienhuis Park Community Center. Newcomers Vic Gopi at 5/2 and Jay Klahr 4/3, took 3rd and 4th place. Both are a welcome addition to our club. Club junior, Joziah Valdez won his 1st official league match over Uncle Zach. I expect this is the beginning of many more wins in the future. Great Job Joziah!! First time club player Jared Valdez notched his first 2 victories of the season. Thank you to all of this week's participants. This author plans to venture West this Saturday to compete in the Oklahoma Winter Games. 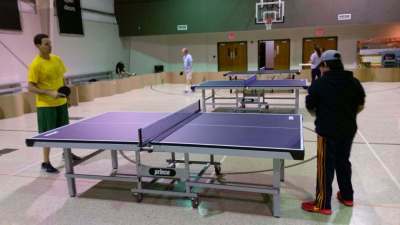 I will write a report on the results of local players who will play at the Oklahoma City TTC's new facility. Good luck to all and hope to see you this Thursday 1/25 at Northside! Spread the word and Bring a friend! League night #6, and the last for 2017, had its highest number of participants so far, at 14. I think this is the beginning of a growth spurt. Hopefully 2018 will see 20's, 30's maybe into the 40's. We will do what we can to make this happen. The more players that attend, the more competitive I can construct the round robin groups. 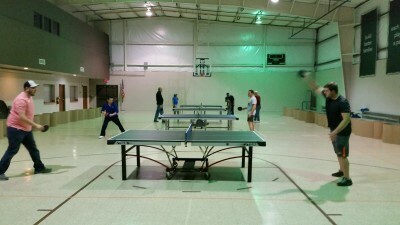 So, spread the word about the Broken Arrow Ping Pong Club and as always, Bring a Friend! Table 1 had Yee Yang defeat 4 enthusiastic opponents. 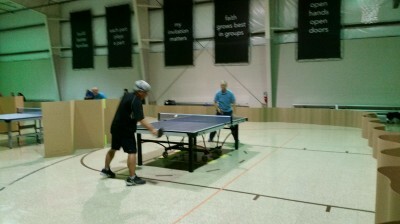 Last week's winner Brad Balmer gave it a game effort but came up short with 3 deuce games in losing 3-1 . Newcomer Tom Jourdan played very well in giving Brad and Robert Yang and Yee all they could handle. We look forward to Tom and his son Ouli attending on a regular bases. Table 2 was very competitive, with six players battling it out for top honors. 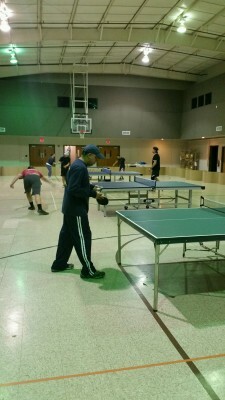 1st time attendee Edgar Acosta, bested all comers, while compiling an impressive 5-0 match record. Other newcomers Matt Mysse and Matthew Rogers took 2nd and 3rd place, with both showing intense determination. Greg Tater, who is motivated and destined to move up the club ranking list, gave a great effort, to lasso 4th place. Regulars Michael Muse and Kurt Turner rounded out the table, and keep learning new skills they take back to their garage to work on. Both are determined to master our sport and improve. The more you play the better you will get. Table 3 winner Ouli Jourdan also defeated 2 of the players on table 2. The young Jourdan will compete on table 2 next week for sure. Great job Ouli. Hope to see you all next Friday 1/05/18. League night # 5 had six dedicated participants battling it out for the table championship. For the first time this season club coach Brad Balmer eked out a perfect 5/0 match record to win the table. Newcomer Rithun Kulangath gave Brad a run for the gold by finishing with an impressive beginning 4/1 effort. 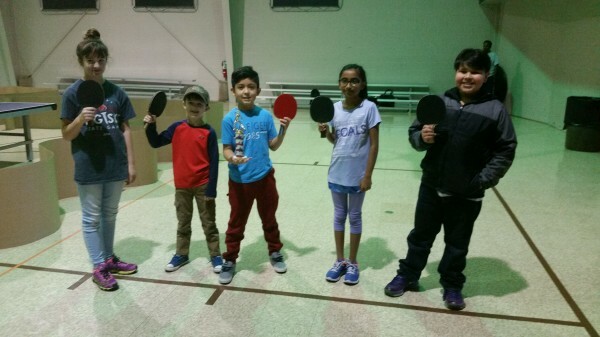 We welcome Rithun and expect he will be on the move up the clubs ranking list while shaking off the rust from a 10 year layoff from our family friendly sport. Third place was secured by regular John Strelow at 3/2 and the clubs other coach Nicole Cullison lassoed 4th with a hard fought 2/3 final record. Rounding out the table was Kurt Turner and Michael Muse. Both are only going to improve has they continue to play. We will be closed for the Christmas holiday and resume play 12/29. If you know of any local youth that would be interested in joining the Jr. Team let Brad know. Hope to see you there and bring a friend!!! League night # 4 had an expected seasonal dip in attendance. Seven dedicated competitors showed up and battled it out shot for shot. Table 1 had a three way tie between Okba Harfoush, David Leonard, and Brad Balmer. David bested Okba in the opening volley with a closely contended best of five duel. 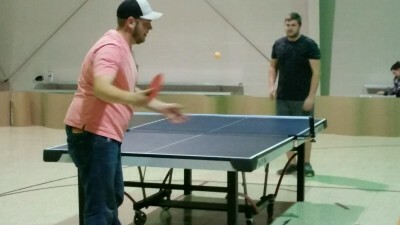 Next, Brad halted David's momentum with a 3-2 upset. I think once David discovers a return solution to Brad's serve, he will roll. The 3rd and deciding match had Okba confidently dispose of a game opponant, Brad, 3-1. This had all 3 players finishing with 1-1 match records. Okba was once again crowned champion due to his 5-4 game record. John Strelow dominated table 2 with a stellar 3-0 match effort. Newcomer Greg Tater exhibited an enthusiastic pen holder onslaught to attain an impressive 2-1 record. Great start Greg! He promised to bring six of his friends next week. 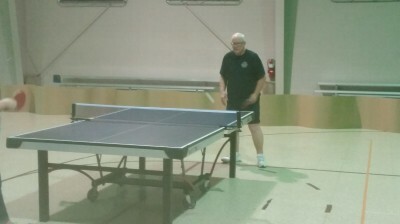 Regulars Bob Brooks and Rick Scott gave it a gallant effort and we thank both for their participation and sportsmanship. If you know of any local youth that would be interested in joining the Jr. Team let Brad know. The next league night is Friday 12/15. Hope to see you there and bring a friend!!! League night # 3 had its highest attendance so far, at 13 competitors vying for the top spots, in two round robin groups. 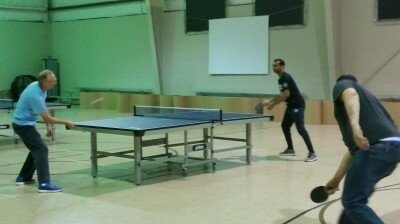 Table 1 was dominated by top local player Okba AlHarfouce with a perfect 12-0 game record and also the first member to have a crowd show up to cheer him on. Who will be the first to take a game off Okba? Alex Tupas took 2nd place with a 3/1 match record with Brad Balmer staking claim to 3rd at 2/2. Brad and eventual winner Alex had a closely fought match with 2 deuce games and a final 3/1 game record. 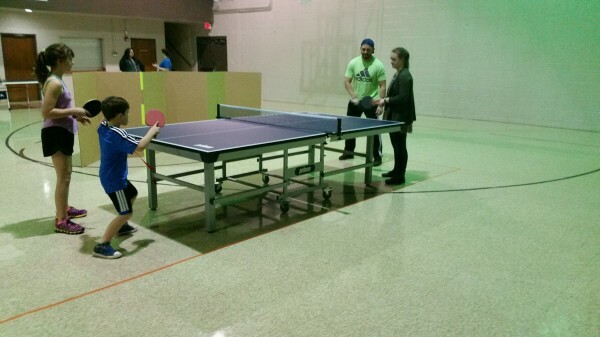 Rumor has it that Brad has his sights set on becoming table 1 champion. 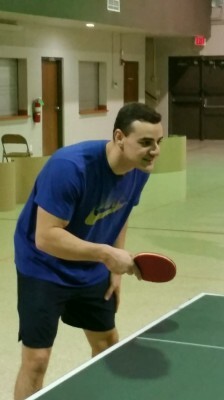 Newcomer Stephan Denis displayed a game effort, finishing with a 1/3 record, however he pushed Alex and Brad to nail biting 5 game matches. Table 2 had 1st time attendee Kurt Turner secure top honors with a perfect 6/0 match record. His buddy, Michael Muse had a game effort and a 2nd place finish for his initial club appearance. Both Kurt and Michael are long time garage players and stated they were glad to find a place to share their competitive nature with other local enthusiasts. Brothers Allain and Cullin Tupas showed improvement from last league night and secured 3rd and 4th place, respectively. Noelle Cullison won her first 2 matches of the season, and she is hoping many more to follow. 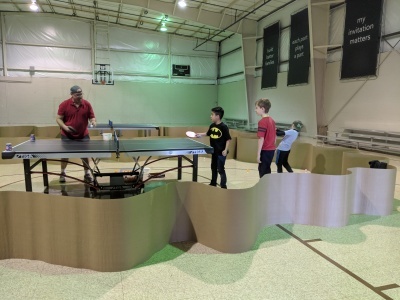 Noelle, along with her brother Steele and local TT player Jacob Andrews are training on Saturdays with the Broken Arrow Junior Team. If you know of any local youth that would be interested in joining the Jr. Team let Brad know. The next league night is Friday 12/8. Hope to see you there and bring a friend!!! The 2nd league night saw attendance double to 10 players. 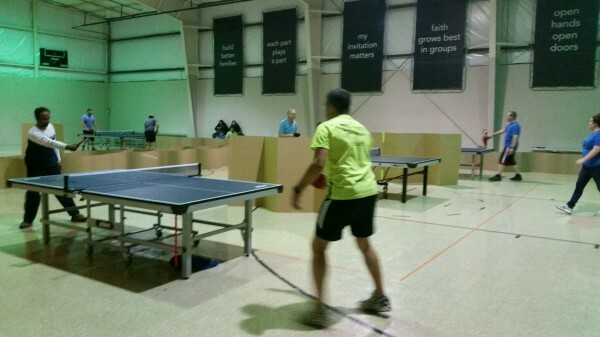 Table 1 was once again captured by top local club member Alex Tupas, with a perfect 4-0 match record. Newcomer Robert Yang edged out Brad Balmer with a 9-9 game record, while both tied at 2-2, in matches. 1st timer and avid participant David Leonard earned a hard fought 4th place. It was a very competitive table 1, with 5 closely matched players. Table 2 had club coach Nicole Cullison on top at 4-0 followed closely by long time player John Strelow. Young Allain Tupas compiled a 2-2 record and a 3rd place finish, and followed closely by younger brother Cullin, at 1-3. Both showed great effort and sportsmanship. New club ratings, record and rank are posted on the club's rating page. The club will be closed next Friday/Saturday for the Thanksgiving Holiday. We will be back in action on 12/1. Hope to see you with paddle in hand, and bring a friend! The first league night is in the books. We had 5 participants on table 1. Alex Tupas came out on top with a perfect 4-0 match record. He was followed by Yee Yang at 3-1 and Brad Balmer with a 2-2 effort. Nicole Cullison compiled a 1-3 record, with a gallant effort against Alex. John Strelow enthusiastically rounded things out at 0-4. John has been instrumental in securing the venue we have available to the club. Thank you, John. Finding a place to house a club seems to always be the biggest challenge. The lighting at Northside is adequate with the flooring more than acceptable. The background color is well suited in the use of white balls, Air flow is fine making overall playing conditions comfortable. 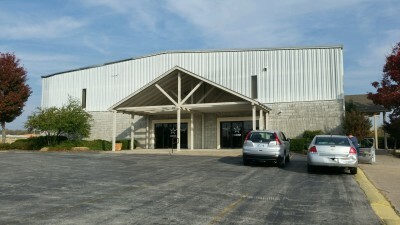 Location of the club is very safe with easy access off the BA freeway and plenty of parking. Thank you to all of the participants for this inaugural league night. We hope to see more players this coming Friday 11/17. Bring a friend!